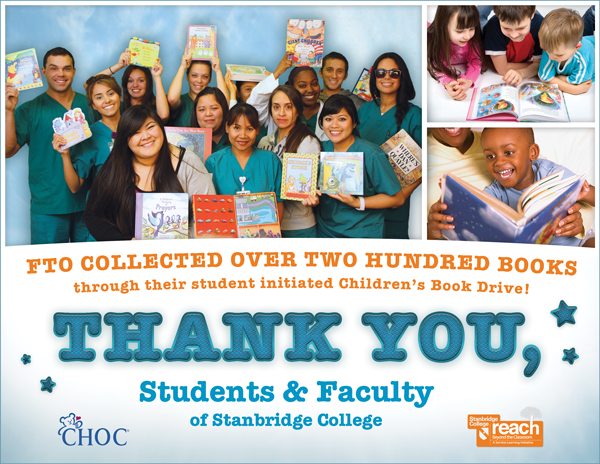 Stanbridge College nursing students from cohort FTO organized and gathered over 200 picture books to benefit the children of CHOC Children’s Hospital of Orange County. Within a few months of graduating, the vocational nursing students wanted to aid CHOC Children’s based on their previous clinical work and lessons in pediatrics and their interest in community service. They asked their fellow students, instructors and Stanbridge College staff to donate children’s picture books in either English or Spanish. Stanbridge College encouraged college-wide participation in the book drive as part of its REACH – Beyond the Classroom Service Learning and Civic Engagement initiative. The REACH initiative provides students with community service opportunities enabling them to give back to their local Orange County and global community while earning credit towards coursework in a structured environment. Stanbridge College encourages its community to learn more about CHOC Children’s to support children in need. To learn more about Stanbridge College’s REACH – Beyond the Classroom, please visit the Stanbridge College REACH program.